On Friday I showed you my new lamps for my Master Bedroom, but my bed was so piled high full of laundry and the room needed a little tidying up, that I couldn't show you how they looked in the rest of the room. Just keeping it real...am I the only one with this problem sometimes??? Here's where I do most of my blogging...I am searching for a floor lamp for the far side of the chair. I love the finish on the lamps...maybe something similar, but a little darker for my lamps in the Dining Room? I would love to get a white matelasse coverlet and change the bedskirt. Shhhhhh, don't tell Mr. Fanatic that I'd like to paint the walls a pale blue. That's the color I wanted to paint this room a few years ago, but blue wasn't a popular color then. Should have gone with my first instinct! Of course, I still have yet to make an upholstered headboard! Great choice! I love the lamps. I like the more neutral tone (the others looked a bit gold to me) and I like that the light is refracted both upward and downward. I noticed you changed the pillows on the bed and I like that too. Personally, I love the wall color, but then I don't know that I'd be truly happy sleeping in a room this color. I need sea tones. So, go with your heart and the blue. Can't wait to see what it looks like. Oh, and I won't breathe a word about the matelasse since I'm planning on getting one too. Shhhh! Where did you get your mirrored end table??? So pretty!! !Your Master is beautiful! I love everything and think your current comforter and room color looks GREAT...but I understand wanting a "change"! Love the new lamps and I have been looking for a decent priced matelasse coverlet for my bed, too. You have a beautiful room and the lamps are a big improvement. The mirrored stands are gorgeous! here i am thinking how much i love the dark color, since with the size it can clearly accomodate it-and then you say you want to change it, lol. i admit-i had to scroll up and down a few times to see the changes, but i really like what you've done by your nightstand, and with the art piece on the wall by it. i think it looks great! This room looks great! I especially love the accessories. Nice work! Thanks for coming by my new blog. It allowed me to find yours! 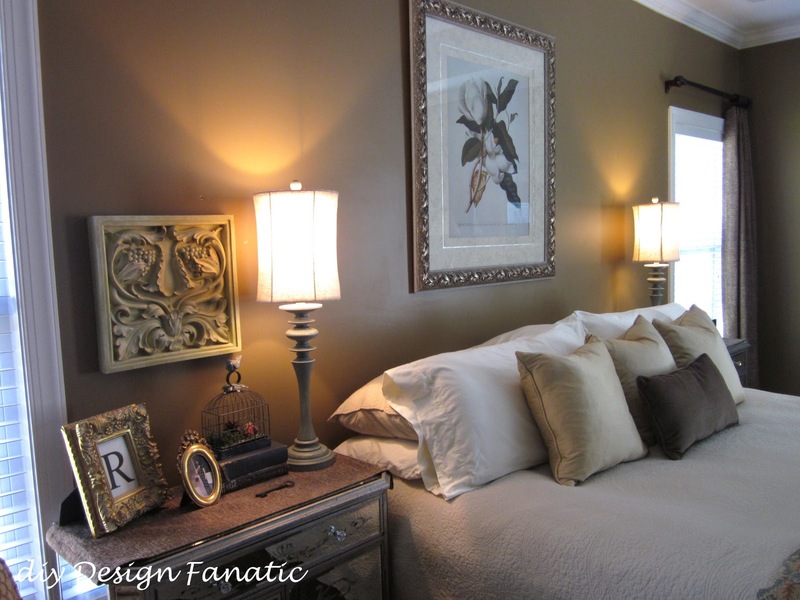 Love the lamps and the pillow changes. Your room is beautiful. I think I will now incorporate a coverlet on my bed. Looks very nice. I am very curious about the shiny night stand. Is it mirrored? Pam your bedroom is sooo beautiful and calming! I wait to get mine that way. Visiting from BNOP. 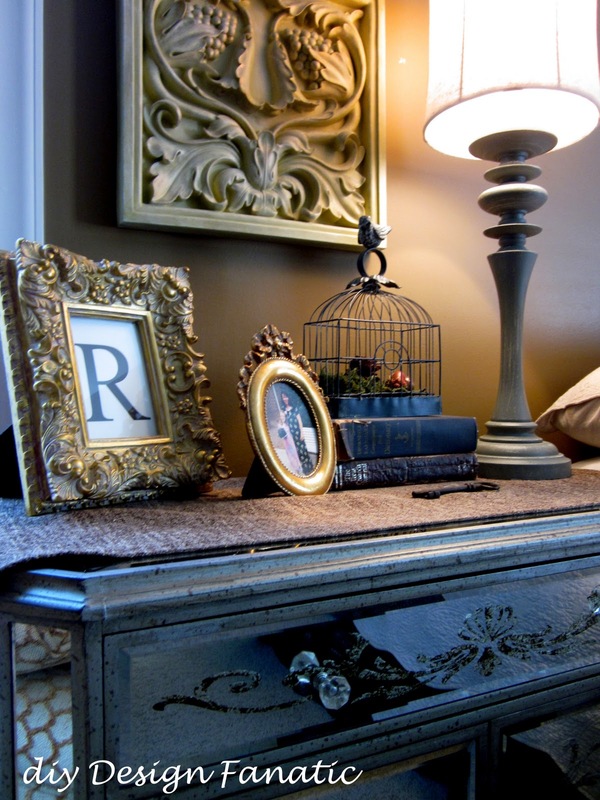 Your bedroom is absolutely stunning and magazine ready! Beautifully done! Oh my goodness, what a beautiful and serene bedroom. LOVE IT! Especially the way you have the comforter folded at the bottom of the bed. Your bedroom looks wonderful. I can't get over the fact how big your bedrooms are in the States. It is a huge space. But you made it lovely and cozy! Your room looks lovely. I am in the process of redoing ours and I have chosen blue for the walls. Happy Valentine Day. Pam-This is just beautiful...both the before and after! I don't think those of us who love design are ever truly finished with any room! I have the same magnolia print in my living room. I can't wait to see the headboard. I love the upholstered ones! Happy Valentine's Day! Lovely! I posted my room too! Stop by and say Hi! The lamps look perfect in your room. I could definitely see the walls painted blue. I'll bet that wouldn't be too hard a sell to your husband, most men seem to like the color blue. What a beautiful peaceful bedroom! I love the new lamps and everything else! Gorgeous! I love how it looks! It's so funny how changing something as small as a pair of lamps makes such a difference. My MBR is on my to do list. Very lovely...I need new lamps and have been looking for sometime now. I like the height on yours! Beautiful room and yes, it would be great in blue. 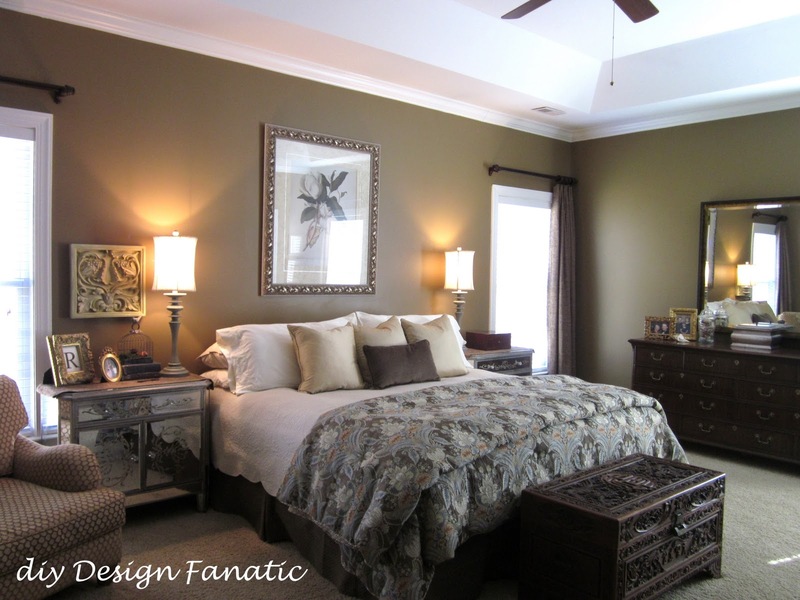 Beautiful master bedroom! The lamps made the difference - very nice. Love those new lamps. They seem more to scale and the color looks great. I think the entire room is so cozy, you'd never get me out of that chair. Those lamps are fantastic!! Your bedroom is so cozy. I have to tell you that I love that initial in that frame! I just kept looking at it thinking how neat it was. I may have to do that! 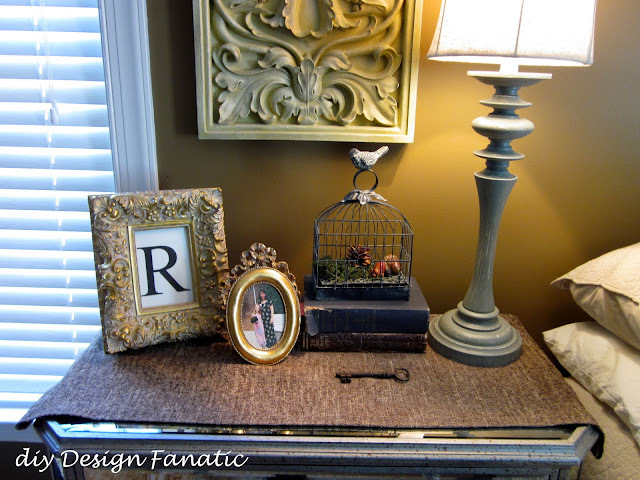 What a gorgeous space Pam! 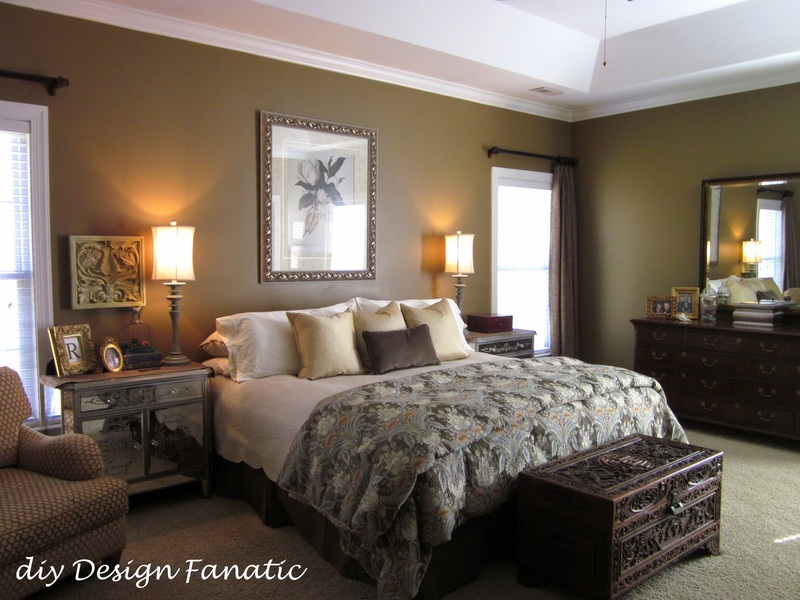 Calm, serene, soothing, really everything a master bedroom should be! Much more chic lamps in your space now. Beautiful room. Lovely room. The lamps are perfect for the space. I'm your newest follower. I just freshened my guest room; stop by the Beach Bungalow sometime and have a look! i love ur bedroom, especially the bedside tables! you are a talented designer! thanks for coming by cottage romance and leaving a sweet comment!